Natalie Hernandez will continue her softball career post-UIC as a member of the National Pro Fastpitch’s Chicago Bandits. UIC softball’s Natalie Hernandez earned a spot on the 2014 roster of the National Pro Fastpitch’s Chicago Bandits during open tryouts at the Ballpark at Rosemont. Hernandez is just the second Flame in UIC history to continue her career at the NPF level; former standout Destiny Mollison competed with the Orlando Wahoos in 1997. Following tryouts, eight players were invited by Bandits coaches to compete in a season-opening exhibition game later that evening against the Indiana Slammers, who the Bandits defeated in an 11-0 shutout. Hernandez and DePaul’s Kirsten Verdun were the lone players selected to join the team. 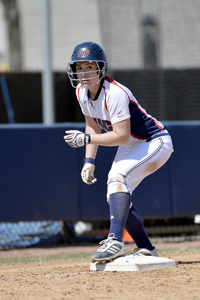 Hernandez recently finished her senior season with the Flames after making her mark in the UIC career batting records with the 10th-best batting average (.347) and eighth-most home runs (24). Hernandez boasted a collection of accolades throughout her career and was named to the All-Horizon League First Team for the second time and the NFCA All-Great Lakes Region Third Team during her final season.